There is no formal requirement for a Visa to visit Pitcairn Island. Visitors must be able to enter French Polynesia to get there. Pitcairn Island does not have an airport. International travelers arrive by cruise ships or on the MV Claymore II, which is subsidized by the British government. 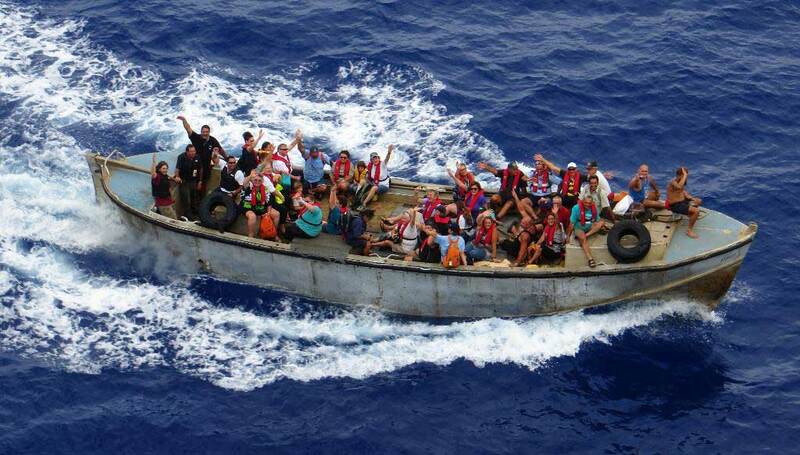 Be aware that cruise ships usually do not tender, but accept islanders on board. The MV Claymore II or a private sailing vessel provide the only access to the island. The Claymore II sails out of Mangareva, Polynesia and makes about 8 roundtrips per year to Pitcairn. Mangareva has an airport with connections to Tahiti. The Claymore typically does back to back voyages in each quarter of the year, so it is possible to visit Pitcairn Island for 4 or 11 days. Check the Claymore II schedule here. Pitcairn Island is in the southern hemisphere about halfway between French Polynesia and Easter Island. That means the weather is warm year round, with slightly higher rainfall in the summer months from November to March. Temperatures then are from 77 – 95 F (25 – 35 C). In the winter months, temperatures average 60 – 75 F (16 – 24 C). 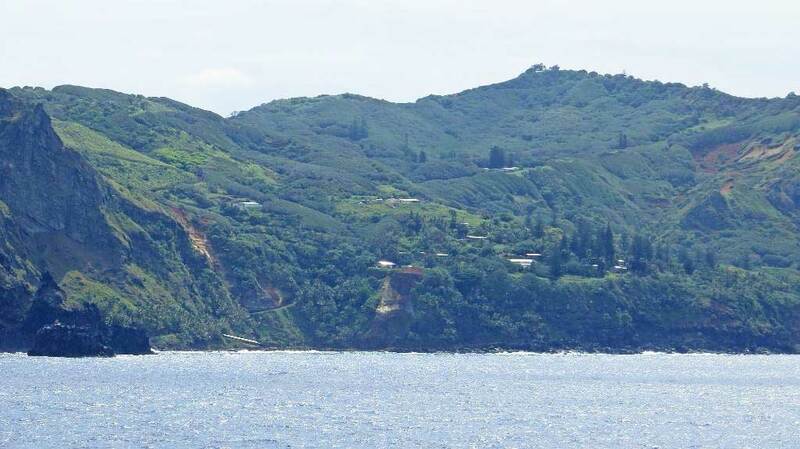 Pitcairn Islands Tourism has a list of things to see and do on the island. They include the Christian’s Cave, Sailors Hide, diving the wreck of the Bounty, St Paul’s Pool, Adams’ grave and the Pitcairn Island Museum. 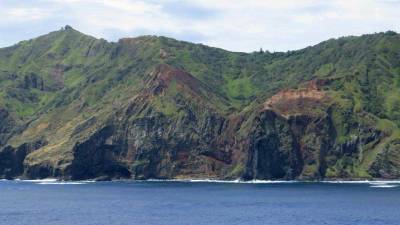 Read our blog about our Pitcairn Island Visit. Pitcairn Island Pure Honey – the British government introduced honey production in 1998. Pitcairn honey bees are disease free and not endangered. Bananas – eat all you want of the natural staple of the island. There are no hotels on Pitcairn Island. Arrange a home stay through Pitcairn Islands Tourism. Pitcairn Islanders lived a very isolated lifestyle. 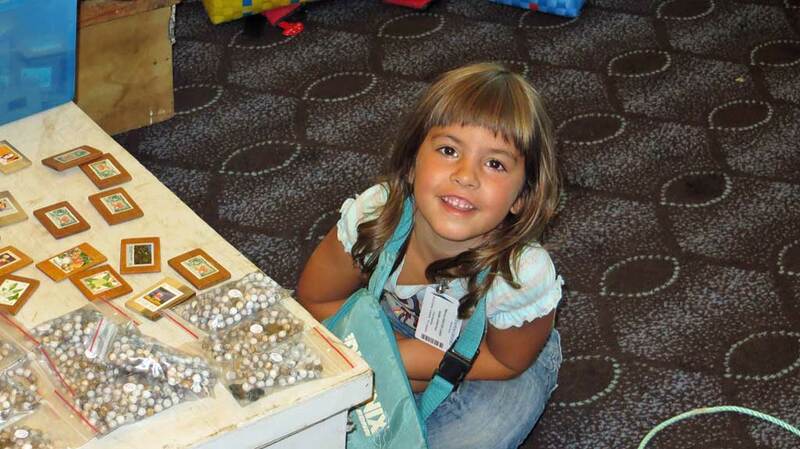 Their main source of income is the sale of handicrafts of wood and coral, T shirts and honey to cruise ship passengers. They receive about 10 cruise ship visits a year, but there are no proper docking facilities for cruise ship tenders. 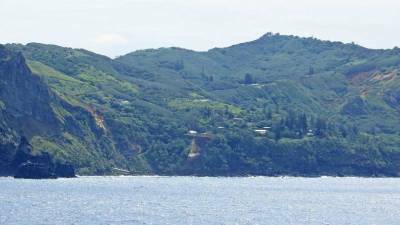 Instead, the Pitcairn Islanders board cruise ships from their community long boat and haul their goods up rope ladders. Children as young as 5 board the ship by ladder too. About 90% of the population of the island typically boards a visiting cruise ship. The Pitcairn Islands get subsides for the European Union and the U.K. which helps support their school teacher from New Zealand and a doctor contracted for a year at a time. 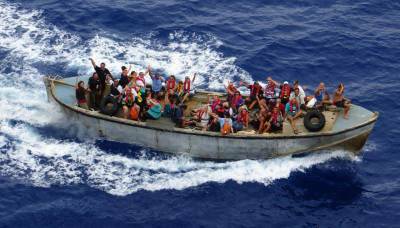 They live on bananas, pineapple, taro, chickens and food imports by regular subsidized freighter service. An electric generator provides electricity for refrigeration and lights, but power is shut down each night to save on fuel. Satellite internet is available to residents, but it is expensive. The community is desperate for an influx of able bodied inhabitants, but has been unsuccessful in recruiting new residents. The Pitcairn Islands are a British Overseas Territory. The islands of Pitcairn, Henderson, Ducie and Oeno form the Pitcairn Islands. The only inhabited island is Pitcairn Island. Pitcairn Island was settled in January 15, 1790 by 9 English mutineers and 18 Tahitians who had taken control of the HMAV Bounty from Britain. There were no inhabitants on the island when they arrived, but there is archeological evidence of a previous Polynesian colonization. The population on the island has varied over the years. In 1856 population pressures caused the British government to support the move of all 193 Pitcairn Islands to Norfolk Island, but 45 of them eventually returned to Pitcairn. The population peaked again at 250 in 1988, but has declined steadily ever since. In 2016 the population was 45 and on the decline. The decline is the result of an aging population that is not being replaced. Children rarely return to the island after leaving for high school education in New Zealand. The HMAV Bounty was commissioned to obtain breadfruit from Tahiti for use in establishing food crops to feed slaves in the Caribbean. While gathering breadfruit, many of the crew became enamored with Polynesia and its women. On their return voyage, near Tonga on April 28, 1789, Fletcher Christian led the mutiny on the Bounty. The mutineers set Captain Bligh and loyal crewmen adrift in a long boat, but 4 loyal crew were not able to fit in the boat. Captain Bligh sailed the long boat to Indonesia. Meanwhile, the mutineers sailed the Bounty to Tahiti. In Tahiti, the Bounty crew dropped off 16 mutineers and the 4 loyal crew. The HMS Pandora captured 14 mutineers in Tahiti in 1791. Then the Bounty and the remaining 9 mutineers sailed through Polynesia until they happened upon Pitcairn Island. There they burned the Bounty until it sank in what is now Bounty Bay and they established themselves on the island. By a twist of fate, the longitude of the island on early maps was wrong by 3 degrees, so Captain Cook and the British navy, who were hunting for them, couldn’t find the island to search it. It took more than 18 years for another ship to reach Pitcairn Island. By then, John Adams was the only remaining survivor of the mutiny. Britain never prosecuted him. Many of the residents on the island today have the last name Christian, Adams and Young.